Back from a long vacation in India, which seems shorter now 😉 wanted to re-live those moments spent with my parents and sisters. 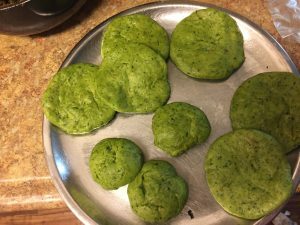 So I tried these “Kachoris”. 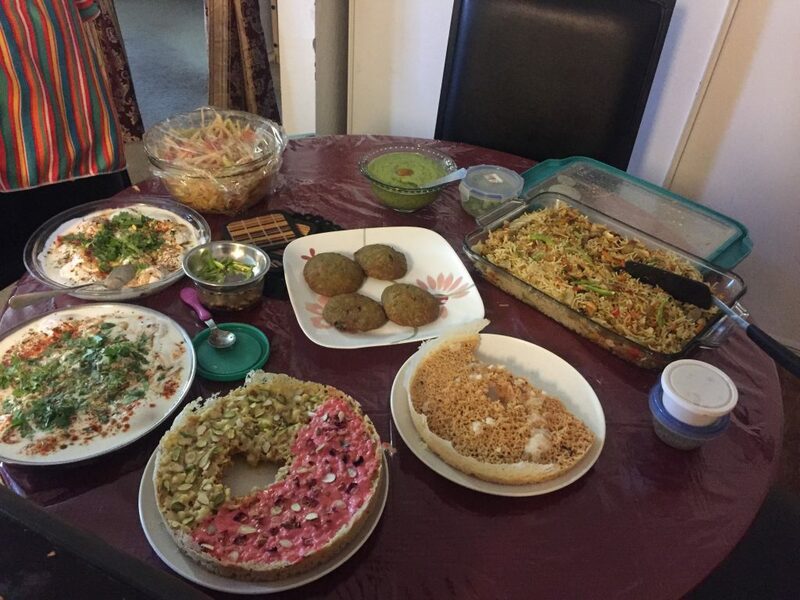 I was fed with all sorts of delicacies back at home with deep love. 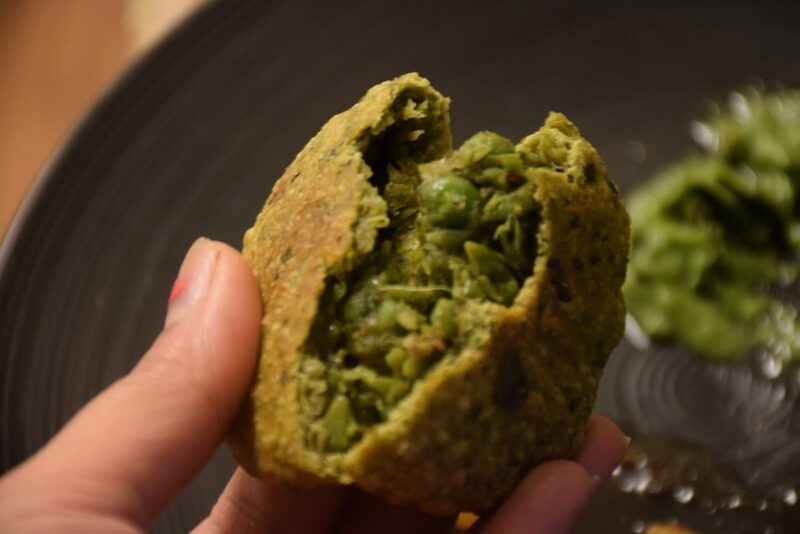 It was then I invited a group of my friends to celebrate “Hariyali Teej” and prepare these puffed crispy breads as an appetizer. Hariyali Teej is celebrated on a large scale in Rajasthan, India. In this festival, ladies gather together to take swing, prepare feasts and party together with Henna !! I came to know of another Teej festival which is celebrated in other Northern parts of India called “Hartalika Teej” in which ladies fast and worship the God. All the Indian festivals are about celebrating life and sharing happiness among folks. 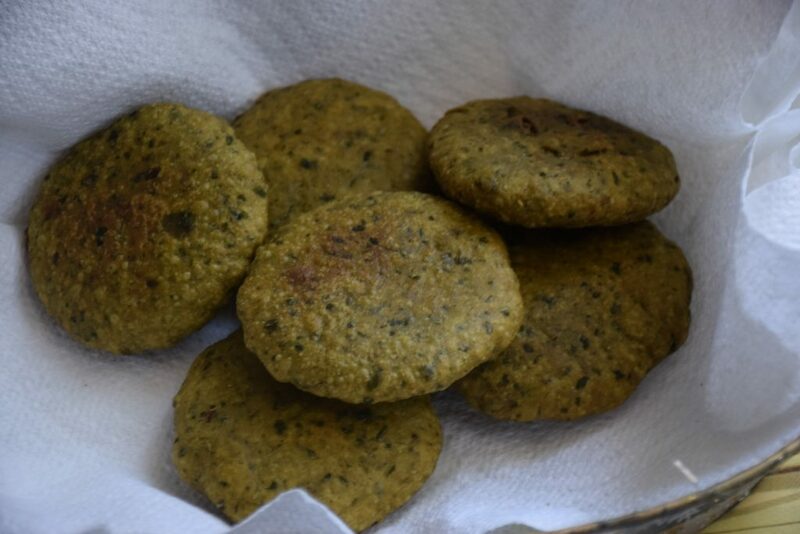 Kachori , or khasta Matar poori, is a type of Khasta kachori with some healthy greens. 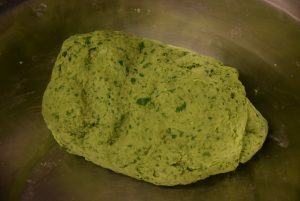 The dough can be kneaded with all green leaves available in the form of a puree. 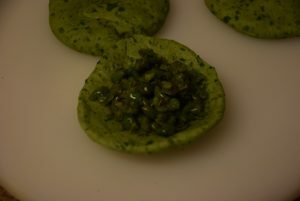 The filling prepared is green too with peas , cilantro and spices. 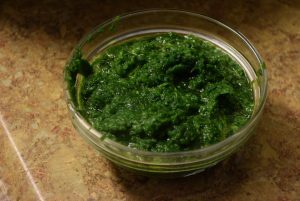 Hence the Hari-Bhari name where “Hari” means green and “Bhari” means filled. I have used “Maida” and “Atta” in equal proportions for kneading the dough. You may use whole “maida” or whole “atta” . Lets proceed to the recipe now..
1. We will start with making the filling first. 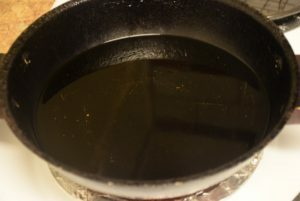 For this add oil in the wok at medium heat. 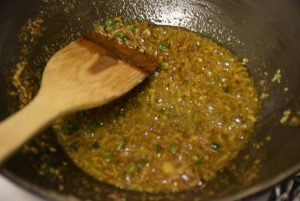 Add cumin seeds and a pinch of hing in the oil , let it sizzle for a while. 2. Now add the ginger paste, green chillies and spices viz. salt, curry powder, coriander powder, fennel powder and red chilli powder. 3. 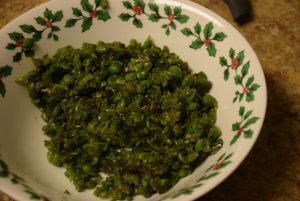 Add the coarsely crushed peas or whole peas if they are frozen. Stir them and lower the heat. 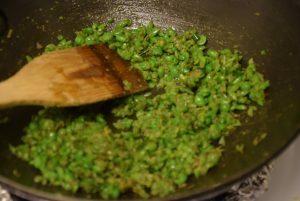 Stir all the spices and blend them well in the peas. 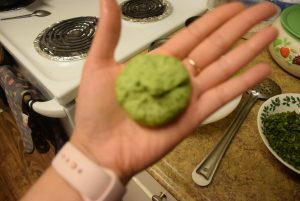 Add some Amchur powder for a slight tartness in the filling. Add some cilantro too and let it roast with everything in the wok. 4. 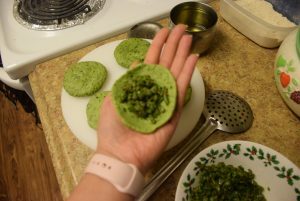 Cover the peas and let them cook for 3 mins till they soften up. 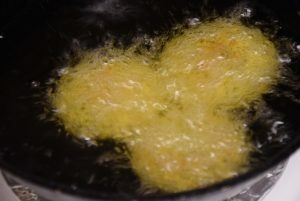 Now uncover them and let the water evaporate on low heat so that the filling turns completely dry. 5. Turn the prepared filling in a bowl and let it cool on the counter. Filling should be cooked and dry by this step. 1. While our filling cools down, we will prepare the dough for the kachori. The dough we need is neither too soft nor too hard. 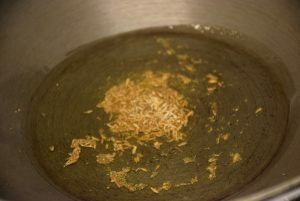 We will first puree our leaves in a food processor. 2. Add the all purpose and whole wheat flour in a tureen(paraat). Now mix them evenly and make a well in the center. 3. 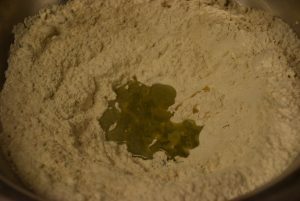 Add oil in the center and sprinkle some salt in the flours. 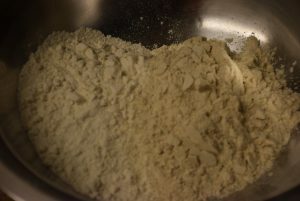 Mix the oil with hands and start adding puree 2 tbsp a time and combine the flours. 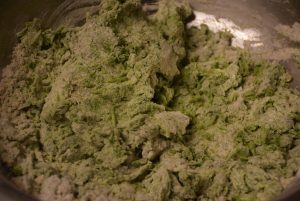 Make a medium soft dough like this and it needs almost one-third cup of puree for this dough. Don’t knead the dough with hands, just lightly assemble it.Cover it and let it set for 15 to 20 mins. 1. 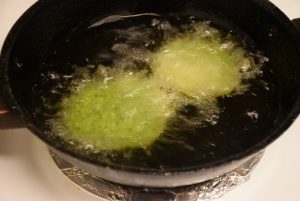 Heat some oil in a deep wok at low-medium heat. 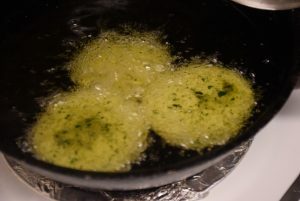 The oil should be just warm such that a tiny piece of dough would sizzle and slowly comes to the top layer of oil. 2. Now take a portion from the dough , shape it by pressing it between palms in a roundel and flatten it. 3. Place 1 tbsp filling in the center and close the bowl shaped roundel from all sides in the center . 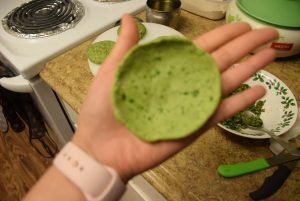 Press the dough in the center and flatten it again by rotating between both hands’ forefingers and thumb. Alternatively, you may roll the dough with a rolling pin with light hands to increase its size. 4. 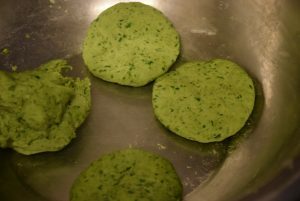 While enhancing the filled roundel (loi) don’t press too hard or the filling might be exposed and ooze out from the dough. In the same manner prepare all the stuffed kachoris and line them in a plate. 5. 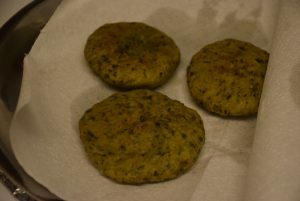 Start adding 3 to 4 kachoris at a time in just warm oil and let them come up slowly and puff up. 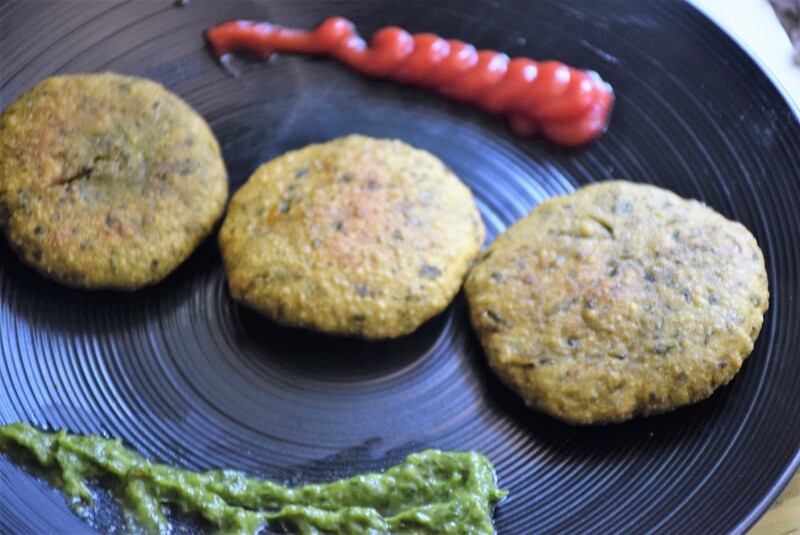 One set of kachoris need at least 15 to 20 mins to fry from both sides evenly. 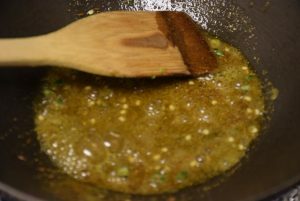 When you see the brownish color at the edges , flip them gently by bringing them towards the edge of wok with a slotted spoon(poni). 6. 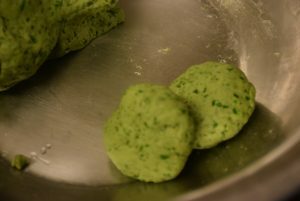 When they are done from both sides, take them out on a paper-towel lined plate which will absorb the excess oil of these Kachoris. Till then , keep enjoying and sharing happiness around the world !!! 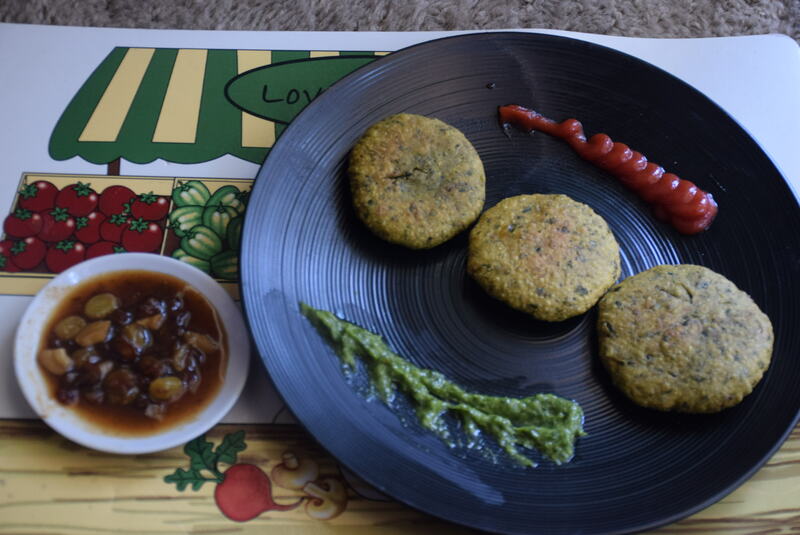 This entry was posted in Appetizers, Food, Main Course, Recipes and tagged appetizer, breakfast, Carenshare, deep fried, Festival, filling meal, hari -bhari, Hari chutney, Hariyali Teej, healthy, Indian, kachori, matar ki kachori, meethi chutney, mix of atta -maida, Nisha Madhulika, no garlic, no onions, North-Indian, palak ki kachori, Saatvik, shweta jindal, snack, special, Teej, vegan, vegetarian, zindagisikhati.